I remember back in 1973 that quite a bit of fuss was made about the release of this album, on Eton John's newly-formed Rocket Record Company. Elton was huge at the time and nobody had yet heard of Kiki Dee (despite her recordings for the Motown label). Despite that, it didn't really do as well as expected, which was a shame as it was not a bad album at all. 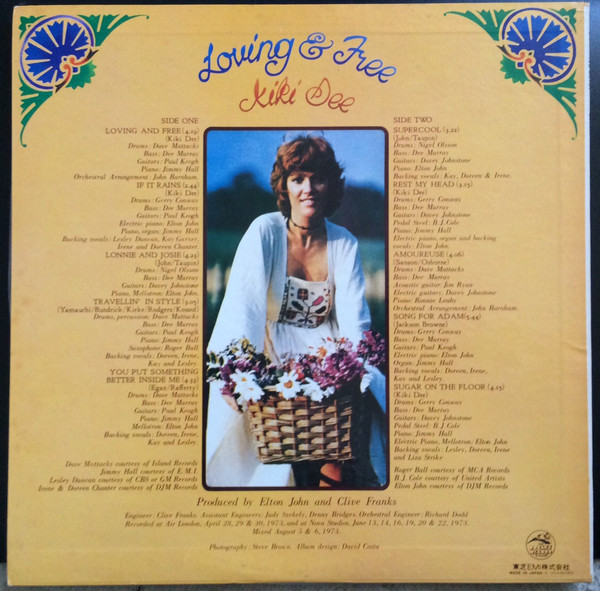 Don't be misled by the pastoral pictures of Kiki on the front and back covers. This is actually quite a rocking album. Elton John plays piano on many of the tracks, and Elton John Band members Nigel Olsson and Dee Murray also appear. Dave Mattacks, the drummer who had appeared with Fairport Convention and Steeleye Span is also present. The remastered sound is excellent too - crystal clear and warmly bassy too. 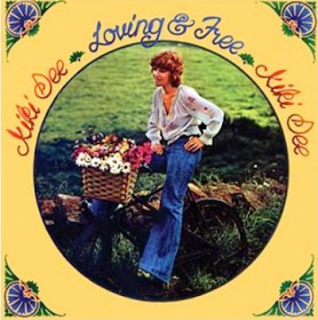 "Loving and Free" is a lovely folk/rock-ish opener, with airs of Lesley Duncan's "Love Song" from Elton's "Tumbleweed Connection". "If It Rains" is a gospel-style song written by Dee herself. "Lonnie & Josie" is so "Tumbleweed Connection" it is untrue. So obviously a John/Taupin song, it is full of Bernie's old West lyrics, like a forerunner to "The Ballad Of Danny Bailey". Free's "Travellin' In Style" is given a big, brassy, rocking cover. Bluesy like the original, but rocking too, with some great guitar and brass. Kiki's voice can rock out too, just as much as sing the quiet, tender stuff. "You Put Something Better Inside Me" is a mid-pace rock song, from Stealers Wheel's Joe Egan and Gerry Rafferty. It is given another muscular, big rock production, again Kiki's voice soars over it. Tracks like these have been completely different to the wistful, laid-back singles that were released from the album , "Loving And Free" and "Amoruese". The rock continues with John/Taupin's rocking "Supercool", crammed full with typical Elton John Band riffs. It is a cousin to "Your Sister Can't Twist (But She Can Rock 'n' Roll)". "Rest My Head" is a country-ish Kiki Dee-composed song, very much in the Elton John mode from the early seventies. The afore-mentioned "Amoreuse" was a hit single in late 1973 and damn good it was too, with a simply sumptuous refrain. It was co-written by Gary Osborne, who was to partner Elton John as a songwriter by the late seventies. I love the song when I bought it as single back then, and I still love it today. Jackson Browne's sensitive "Song For Adam" is covered beautifully. Jackson Browne was not well known at all at the time, so it was not a song known by many. The album closes with the lovely country-style ballad "Sugar On The Floor". The song was later recorded by Elton John as the 'b' side to "Island Girl". I am not sure who wrote the bonus track "The Last Good Man In My Life", but it sounds very Elton John-esque, as indeed does the rocking, bluesy "Hard Luck Story". "Everyone Should Have Their Way" is a soulful, sweet saxophone-backed number, while "Six Days on The Road" is another kick-posterior rocker with some rollicking barroom piano from Elton. Overall, this is a highly recommended, little-mentioned gem of an album.